Every now and then you may need more money than you have on hand. Perhaps you want to make a big purchase or need a helping hand to overcome a short-term financial hurdle. 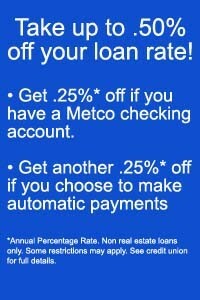 Whatever the reason, Metco offers affordable personal loan products to fit every budget. Qualified members may borrow up to $10,000 unsecured for a maximum term of 48 months. See our current rates for unsecured personal loans, and then apply securely online today!